This command creates a “clone” of a specified user (not supported for the system databases) database that contains all objects and statistics of the specified database. Hmm, could be useful, but, how does it work? Let’s have a look. There’s the stats, SQL thinks that there’s 1000 rows in the table, pretty cool. What we’ve ended up with is a read only database with no data but the objects and stats of the target database. First thing, I’d be doing is backing that clone up and bringing it down to my local instance. Want to see how code will execute against production but don’t want to touch that prod environment? Here’s your answer. 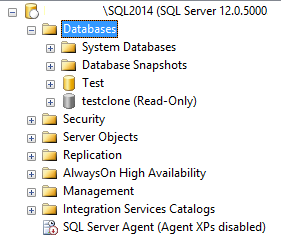 @Microsoft, can we have this for other versions of SQL please? This entry was posted in General, Internals, Maintenance. Bookmark the permalink. This functionality has existed since SQL Server 2005 – see https://support.microsoft.com/en-us/kb/914288. That KB article reveals the supported and documented steps to generate a statistical clone. Those steps are not as convenient as the undocumented dbcc clonedatabase, but unlike undocumented commands, that KB’s functionality will not change without advanced public notice. In older versions of SQL Server it was also possible to sp_configure ‘allow’, 1 reconfigure with override, and hack (BCP) the statistics into another database, which is in part why the documented and supported method was published for 2005 and above. How is a cloned database different than a database snapshot? DBCC CLONEDATABASE creates a copy of the database with no data, just the database objects and statistics.